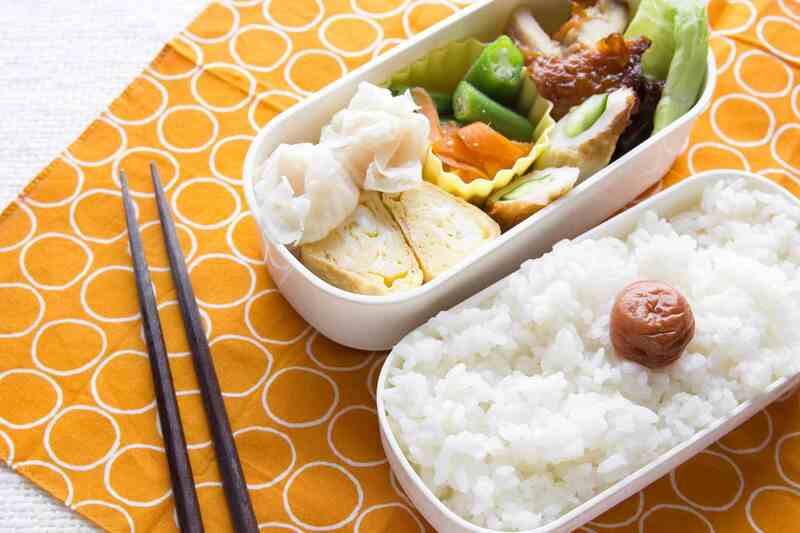 Packing a Japanese style bento lunch box is easier than you might think. Simply plan ahead and make an extra portion of your dinner to include in your bento box the next day. This article includes a list of bento items that can easily be made a day ahead and enjoyed for both dinner or lunch the next day. Don't know where to start? Read this primer regarding How to Make a Bento, to help you get started. Rice balls can be made quickly and they're easy to eat with your hands. It can be made with many different fillings and is considered a staple item for Japanese bento. While SPAM musubi is more popular in the West than it is in Japan, it is often a bento favorite among kids and adults alike. Inari sushi can easily be prepared in 15 minutes with this quick recipe. It’s a great finger food to include in the bento. Tamagoyaki or egg roulade is a classic bento item that is commonly found in Japanese bento and is a great filler or side dish. While soy sauce eggs are a popular food that is often served with ramen noodles, it's also a great addition to bento and acts as a great filler. Japanese cuisine often has many side dishes, and including small side dishes in a bento is common. This spicy yam cake recipe is one such example. Baked chicken karaage, is a healthier version of Japanese fried chicken which is loaded with umami flavor and is a wonderful addition to bento. Teriyaki chicken meatballs, or tsukune, are great for an evening meal but are even better as a bento item. These are also easy to eat as finger food or with small food skewers. Grilled, baked, and fried fish are all very popular Japanese bento items. Shio koji salmon is easy to prepare and leftovers are perfect for adding to a bento. While these rolls are often a popular appetizer or item for dinner, they are a particularly special dish when packed in a bento. Gyoza is a popular food item for Japanese bento and also an easy finger food. Wontons are an easy finger food and always a favorite to include in a bento. Croquettes are a very popular food item for Japanese style bento. Traditional korokke are made with potatoes, vegetables, and meat. Try Japanese pumpkin (kabocha) korokke for a fancy treat. Edamame is quick to make, packed with protein and adds beautiful color to any bento. Try an easy spicy version of edamame with the recipe here. Tsukemono pickles are often included in Japanese bento as they often compliment the rice portion of the bento. Try easy soy vinegar cucumbers or sweet and tangy daikon radish pickles.